Finish off your look with Rafe’s bold textured clutch. Gold hardware gives the design a luxe factor. 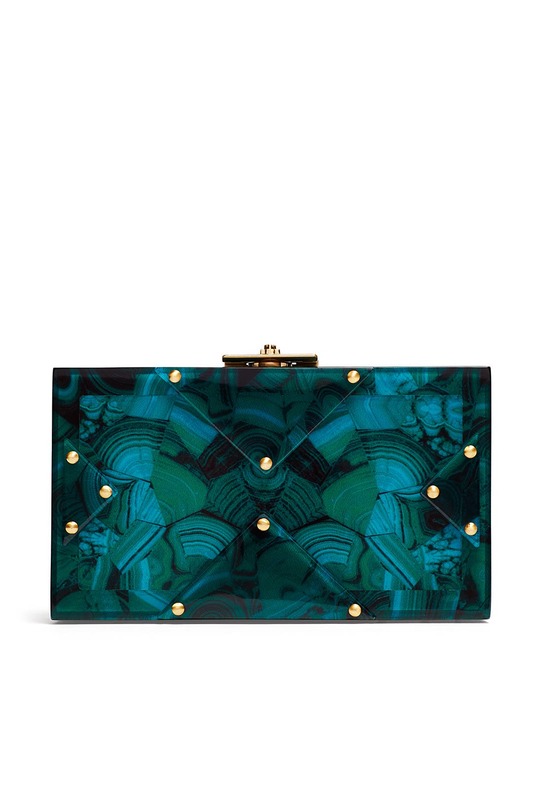 Malachite lucite clutch with geometric design. Top clasp and hinged bottom. Removable chain shoulder strap with 24" drop. 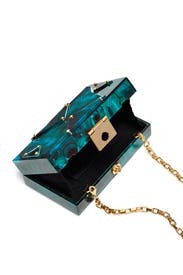 4"H x 7"W x 2"D.
Just a stunning statement purse. I took this to a baby shower and brunch. The purse is very pretty and I got compliments on it, but VERY little can fit inside of it. My phone, wallet, and lipstick just barely fit, and only if I stacked them perfectly. 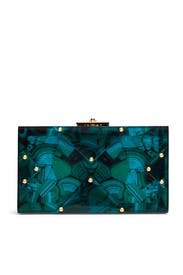 I wore this with a little black dress with emerald and gold earrings and black and navy shoes for Valentine's Day and this clutch went PERFECTLY! Even the waitress and a woman at another table complimented me on such an unusual and lovely clutch. I was able to fit my phone (Samsung S5), lipstick, powder compact and kabuki brush, and keys in here comfortably. Would definitely rent it again.